Yesterday's match up had the feel and look of a playoff game. It was a tight pitchers duel between two aces and the crowd was into it. Why? Because the road back to another World Series will go through the Motor City in the ALCS. Simple as that. If we make it past the ALDS, we will most likely see Detroit again. If that were to happen, my prediction would be that it would go 7 games, with the Red Sox ultimately winning. Why, you might ask? Because of last night. 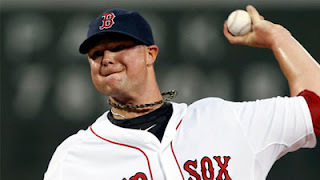 Jon Lester out pitched the best pitcher in baseball right now, Max Scherzer, and he looked really good in the process. Huge confidence boost right there. Also, the Red Sox have had some success against Justin Verlander recently, like when they beat 6-3 him at Fenway early last year. So again, huge confidence boost because we know we can beat their top 2 starters. The Red Sox hold a major edge as far as pitching goes, especially if Clay Bucholz returns before the playoffs start. If/when Bucholz our rotation will probably look something like this: Lester, Bucholz, Lackey, Peavy, Doubrount. That's scary for opposing teams given the way we've been pitching lately. True, Detroit has the best 3-4 combination on the planet with Miguel Cabrera and Prince Fielder, but Jon Lester proved last night that a strong pitching performance can shut them down. The only advantage the Tigers hold is defense, especially with Jose Iglesias at shortstop. Iglesias has made a huge difference in this series so far with his glove and he's also made an impact with his bat, driving in the lone Tigers run last night. Clearly, both of us benefited from the trade that brought Jake Peavy here and saw Iglesias go to Detroit. Iglesias has been huge for them and he'll bear watching for the rest of the season, as he could be a difference maker in a potential playoff series between these two teams. But then again, Peavy will be exactly that for us, so they'll have to watch out for him. First, we both have to get to the ALCS before this can become reality, but that is looking more likely as the season goes on. What do you guys think? Does our road go through the Motor City? Tweet me @ConorJF1016 or leave a comment with your thoughts.